This ecoregion occupies the western slopes of the Cascade Range from Tinkham Peak-a few miles south of Snoqualmie Pass-to the Columbia River. The northern boundary follows the divide between the Cedar River and Snoqualmie River drainages; the southern boundary is the Columbia Gorge from Cape Horn to Dog Mountain. The western edge lies roughly at the 1,000-foot contour, a few miles east of the Puget Trough communities of Issaquah, Enumclaw, Eatonville, Longview, and Battle Ground. Outside Washington, the ecoregion continues south through Oregon nearly to the California border. The West Cascades are volcanic in origin, with older oceanic crust exposed in a few places. Heavily eroded old volcanoes, long extinct, are dominated by the peaks of the Cascades volcanoes, active into geologically recent times. These include Mount Adams and Mount Rainier, Washington's two highest peaks, and Mount Saint Helens, the state's most active volcano, which blew its top in a violent explosion in 1980. Decomposed lavas, volcanic ash, and mudflows are the source of the region's soils. Many small, swift mountain streams merge into larger rivers that flow north from Mount Rainier to Puget Sound or west and south to the Columbia River system. Dams retain several large reservoirs at lower elevations, while numerous lakes occupy basins carved by mountain glaciers. The Columbia, tidal to Bonneville Dam, follows a near-sea-level cut through the Cascades. Prevailing winds from the Pacific Ocean endow these slopes with a mild climate and plenty of moisture. Temperatures are similar to those in the adjacent Puget Trough, although much colder at high elevations. Precipitation, coming mostly in late fall and winter, ranges from an annual average of as little as 60 inches at low elevations to 140 inches or more in the mountains, where it falls mostly as snow (50 feet in an average year at Paradise on Mount Rainier). Snow stays on the ground well into summer at higher elevations; Mounts Adams and Rainier have permanent snowfields and glaciers. A significant rain-shadow effect creates a drier microclimate on the eastern side of Mount Rainier (Sunrise). Over 90 percent of the ecoregion is covered by conifer forest, ranging in age from recent burns and clear-cuts to old growth. Douglas-fir, western hemlock, and western red cedar characterize the lower forest zone, with salal, sword fern, red huckleberry, Cascade Oregon grape, and vine maple in the understory. Pacific silver fir and western hemlock are the dominant species in the wetter zone above 3,000 feet. Devil's club, lady fern, and skunk cabbage are common wet-understory plants. 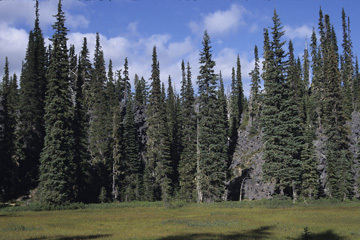 Typical trees of the subalpine zone above 5,000 feet include subalpine fir, mountain hemlock, and Alaska yellow cedar, along with common beargrass and various huckleberries in the understory. Also found at these higher elevations are sedge meadows, sphagnum bogs, and willow swamps. Above treeline is a parkland zone of subalpine and alpine meadows with isolated stands of montane conifers and a ground cover of dense, often mat-forming plants such as heathers, sedges, and huckleberries, along with false hellebore, lupine, and other herbs. Red alder, bigleaf maple, and black cottonwood are the ecoregion's usual deciduous woodland trees, found mostly along lower-elevation stream corridors. Garry oak, madrone, and poison oak occur commonly in the rocky, exposed terrain of the Columbia Gorge. With the exception of a few small towns along highways in the major river valleys, and campers and seasonal staff in parks, the ecoregion is uninhabited. Nearly all forest tracts at low to middle elevations are managed for timber production, harvested and replanted in rotation. The less accessible higher-elevation forests are relatively little disturbed. Large sections are permanently protected in Mount Rainier National Park, Mount Saint Helens National Volcanic Monument, and several wilderness areas. North of Mount Rainier, however, commercial logging has been the rule right up to the crest, but the City of Seattle has recently stopped timber sales in its Cedar River Watershed and will maintain the area as an ecological reserve.